Pat Steinberg: Calgary Flames defenseman Travis Hamonic practice yesterday and he could be available tonight. Hamonic missed Sunday’s game with a lower-body injury. Ted Kulfan: Detroit Red Wings coach Jeff Blashill said they’ll find out today if Dylan Larkin is ready. No update on Tyler Bertuzzi‘s upper-body injury other than he’s not ready to practice or play yet. Jameson Olive: Florida Panthers coach said that Jayce Hawryluk is day-to-day with a lower-body injury and it’s 50-50 that he’ll be in the lineup against the Penguins. Curtis Zupke: Los Angeles Kings coach Willie Desjardins said that forward Jeff Carter is doubtful. He hasn’t received any update but doesn’t think his injury is bad. Forward Trevor Lewis is expected to return to the lineup at some point on their road trip. 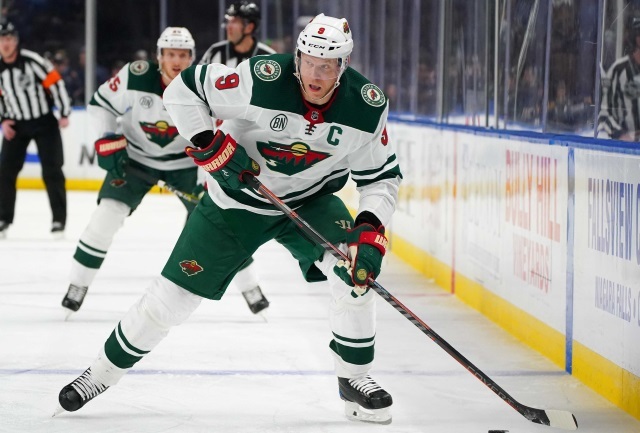 Minnesota Wild: GM Paul Fenton announced that Mikko Koivu tore his ACL and meniscus in his right knee and will be out for the remainder of the season. His surgery is expected to be performed on Friday. Nashville Predators: GM David Poile said Zac Rinaldo will be having shoulder surgery that will end his season. Matt Vensel: Pittsburgh Penguins coach Mike Sullivan said that Matt Murray has an upper-body injury but it is not a concussion. Murray, Evgeni Malkin and Justin Schultz will all travel with the team. Scott Billeck: Winnipeg Jets defenseman Dustin Byfuglien will return to the lineup tonight. Scott Billeck: The status of defenseman Josh Morrissey isn’t known yet. He could return to the lineup but they don’t want to rush him. Coach Paul Maurice said it’s not a long-term injury and they will see how he feels today. Brian Munz: Forward Bryan Little and defenseman Josh Morrissey are the only two Jets players that didn’t practice yesterday before the team left for Montreal.